Our family get-together trip to Colorado almost doesn't happen, because of a series of natural catastrophes threaten to make it impossible to breathe. We get luckily. 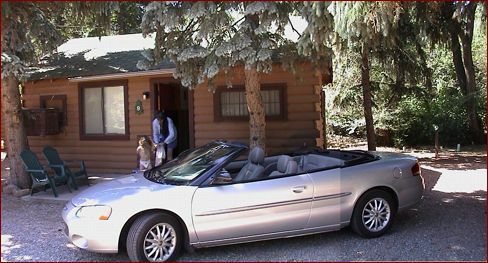 Our trip begins: two jet flights, a series of delays caused by thunderstorms, a convertible rental car, a drive in the night, and arrival at the Timber Lodge, in-between the towns of Colorado Springs and Manitou Springs. We start our Independence Day celebrations with a very satisfying breakfast at Adam's Restaurant, in Manitou Springs. In the afternoon we head out to the Cave of the Winds, where we go deep underground. The surrounding scenery is arid, weathered, and well worth the travel time. Of course I have more details for you. We start off the day with a breakfast at cabin no. 1, the temporary digs of Adam, Felicia, and Ziggy Mo. We visit the Garden of the Gods, get caught in a thunderstorm, and eat good Indian food. Today we head south to the Royal Gorge, seen here from the upper parking lot. After about an hour in the car we were happy to stretch our legs and look around. Not much to see? The irony of San Franciscians travelling so far by plane and car to walk across a suspension bridge wasn't lost on us. But it was well worth it. It was a joy, strolling across the wooden planks, looking down into a gorge travelled by rail, boat, airplane, and helicopter. We still don't understand the motor vehicles policy, though. At first we thought it was just the elderly and the lame, but as SUV and motorcycles joined us on the bridge, we suspected the policy included the vain and the stupid. After being forced out of the way by station wagons we amended that to include the clueless. All that dodging of chrome and rubber made us hungry, so luckily the restaurant at the edge of the gorge was nearby. Not exactly the Restaurant at the Edge of the Universe, the food was much better than other tourist concessionares at which we've had the unpleasant misfortune to dine. We, um, gorged. We ended our visit by taking the Incline Railway - a combination of a San Francisco cable car and a funicular - down 1500 feet (in five minutes) into the gorge. Cool and pleasant, and a refreshing perspective on the day's events. In every trip I've taken there's always that rest day. This was ours. An underwhelming breakfast at the Mountain Shadow in Colorado Springs' "old city" (in which there's little old but much that is crass and commercial and new), another visit to the Garden of the Gods, an afternoon swim in the pool, a wonderful (albeit amazingly expensive) meal at the Craftwood Inn, a twilight visit to the Garden of the Gods, and a very early morning write-up of the day's events. Today's the day we plan on visiting the Seven Falls area of Colorado Springs. (Actually we plan on visiting it twice: once in the daytime and again at night to see the multi-colored illumination.) We wake up early in the morning, 0830, so we can pack the car and head over for breakfast. A hearty breakfast it is. I've cooked up some Masala Tea (something akin to chai) and we've got eggs, salmon a la Adam, bread, cheeses, jams, juices, and more. Oh, and bagels, cream cheese, coffee, cereals. I'm stuffed. We head out to Seven Falls. This is the view from the bottom of the falls. Omi is in the center, the visitor's center is to the right, and the trout area is to the right of that. Isaac dropped a few quarters into the fishfood dispenser, but the trout were so stuffed they ignored the offerings. Here we are at the top of the falls. Mom, Emil, and Adam wanted to walk up, but the stairway was closed (halfway up, so they had to turn around and re-join us at the bottom). There's a very cold tunnel leading to the elevator. On a hot day like today the tunnel alone is worth the cost of admission. It's a moist cold, from the rocks, and it's very soothing. After the falls it's lunchtime, and we're all hungry. We drive around and around, eventually leading to the Broadmoor Hotel. Here we are in their English-style tavern. The food is okay, but only okay. They could do so much better. This is the grounds of the Broadmoor. In the distance is the Cheyenne Mountain North American Aerospace Defense Command (NORAD) facility. Here's another view of the Broadmoor, this time from the second-story balcony overlooking the entry. Isaac and Lila loved running around here, and playing in the oversized stuffed chairs inside. After the Broadmoor we headed back to the Timber Lodge, where we split up. The rest of the family made a bar-b-que near the pool, but we had plans to visit Phil Dubois at his nearby home. How nearby, though, we didn't realize. It was right next to Seven Falls! I met Dubois at a Cypherpunks meeting, where he and Phil Zimmermann spoke about a case being threatened against PRZ. (Having two Phils in the same sentence, repeatedly, is why Dubois is called Dubois :-) And so I joined the Zimmermann Legal Defense Fund. Dubois and I have kept in touch via email since. And now I was going to visit his home. It turns out to be a beautiful home, and he a gracious host. His family was pretty amazing too. His wife was as gracious as he, and the kids made this stop the best one of all for Isaac. Lila liked being licked by one of the dogs. We start the day with a visit to a meandering creek under a cooling canopy of trees. Perhaps the perfect moment of this trip. We continue upstream to the Helen Hunt Jackson Falls. We end the day with another twilight drive through the Garden of the Gods on the way to our dining destination for the evening: the Castaways steakhouse. Then we have a last vacation chat at Mom's cabin. Tomorrow we are to be woken at 06:30, turn the car-key at 07:30, and take off at 11:50. Too damn early. Today was our return travel day, as we hopped through DEN, LAX, to SFO. It was a full day of travel and delay, but nothing terribly out of the ordinary or horribly uncomfortable. This is the departure terminal at LAX. Our family time isn't yet over. We may have shed Emil & Oma for the moment (they're coming out to SF next month), but Omi Marga will be with us for almost two weeks. The guest room is ready, and we're pretty excited. And tired.